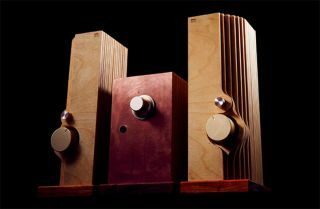 The 'Bacon' system serves up lossless-quality wireless streaming | What Hi-Fi? Yes it is actually called Bacon and there's an accompanying amplifier called Cheese. But the wireless streamer means serious business. Another day, another interesting crowd-funding proposition. And this one has a funny name. The Bacon system comprises a TX transmitter and an RX receiver, and can work with pretty much any source. Your source, whether it be a CD player, turntable, TV, laptop or NAS drive, connects to the Bacon TX. The TX has five inputs: RCA analogue, HDMI, digital coaxial, digital optical and USB. The TX then sends audio to the Bacon RX receiver, and it’s this that connects to your hi-fi system via RCA or S/PDIF outputs. If you want to listen through headphones, then you need the Cheese amplifier. This connects to the Bacon RX. The system uses proprietary digital uncompressed audio link technology (DUAL) to create its own network, and is capable of delivering music in up to 32-bit/382kHz quality. Skyline Innovation, the company behind Bacon, says you can create a multi-room system with Bacon, using the TX transmitter to send audio to multiple RX receivers. Alternatively, you can create a 5.1 surround sound system, with RX receivers connected to your rear speakers. Bacon is currently seeking funding on Kickstarter where it has received nearly $20,000 of its $200,000 goal. You can pre-order a TX and RX package from $549 although they’re currently only shipping to North America. Skyline Innovation says this is just for the current phase, so hopefully it’ll be available for worldwide shipping in the future. You can also read more about it on the Bacon Audio website.